…is to explain how network models can be used to describe development projects. Descriptions can be useful for documenting an intended set of activities and outcomes, and for documenting the actual activities and the outcomes that eventuate. An evaluation will normally need to develop and compare both types of description. There is a background assumption being made here: that better descriptions of planned and actual developments will make it easier to implement these developments, and to evaluate them. Consider an extreme negative example of this proposition: what would be the consequences if the contents of all project proposals had to be communicated by mime? Working with the Logical Framework, a section of the MandE NEWS website. 2. Where are network models likely to be a useful means of description? Where there are many actors (people and / or organisations) who are fairly autonomous and where there is no central authority. In large projects with many stakeholders, rather than small projects with few, where a single authority is less likely to be found. In projects where there is no single objective, but many alternative and/or competing objectives. In projects deliberately designed to function as networks (called “named networks”, in this paper). Network models can also be useful as a means of describing projects that are more “traditional”, where there is a single agreed objective, clear lines of authority, clearly differentiated responsibilities, and which can be describe by a temporal logical model (e.g. a Logical Framework). Here network models can provide supplementary detail that cannot be easily represented otherwise. For example, the relationships between multiple Activities and multiple Outputs, or multiple Outputs and multiple Purposes (outcomes). 3. What is a network? A network is a collection of people and / or things that are connected to each other by some kind of relationship. Many kinds of entities can be part of a network: people, projects, documents, events, organisations, cities, countries, etc. And there are many kinds of relationships that can link such entities, involving transmission or exchange of information, money, goods, affection, influence, infection, etc. Note: Within this definition, named networks are part of a much larger set of networks. A network does not need to be labelled or formally named as a network to be a network. Note: Because this webpage is concerned with the use of network models for planning and evaluation purposes the focus will be on networks of actors, objects and events that are observable. That can be interviewed or that can be read about. So network models of more abstract processes will not be discussed here. In the narrowest sense, network analysis is the analysis of the structure of relationships within a network. A wider and more useful view also considers the attributes of the members of a network. The tools used for network analysis come from a field of social science known as Social Network Analysis (SNA). SNA is especially relevant to the development of network models of development aid programs, because development aid is about people and their institutions. SNA is the main intellectual influence on the contents of this webpage, and the other related papers mentioned above. Network analysis is also used in the study of biological systems, physical systems and economies, but those usages are not discussed here. A network of community organisations (formal and informal, modern and traditional) linked by overlapping membership, or by authority relationships. A network of enterprises, lined by their commercial relationships, forming supply chains and networks within a specific industry. 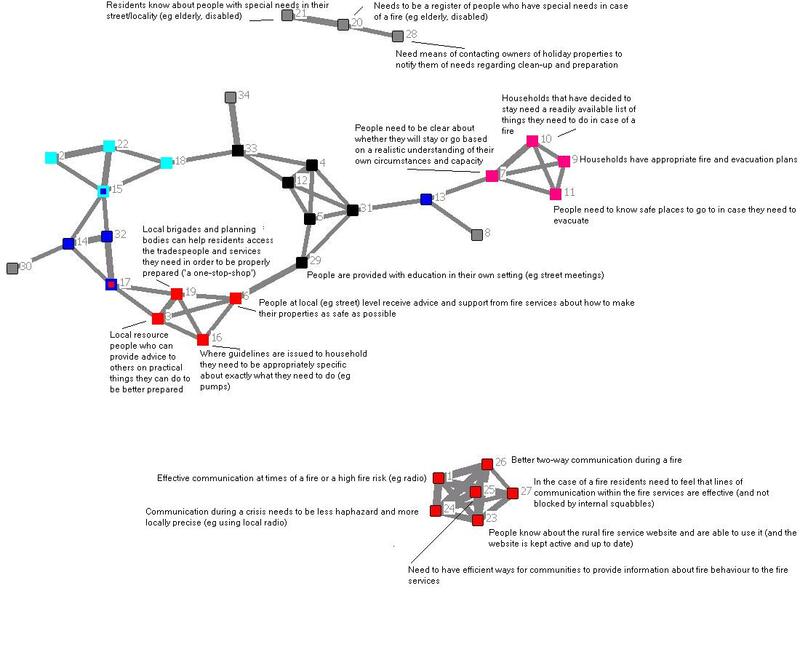 A network of policy documents, linked by overlapping sets of indicators of achievement. The focus in this paper will be mainly on matrices and network diagrams. The network matrix shown below documents the existence of relationships between a set of 16 NGOs in Ghana. Each cells value tells us the number of times a specific relationship was mentioned in an NGO report. Note that the convention with such matrices is that the cell entries always show the relationship that exist from the row actor to the column actor. In other words, how often the row actor mentioned some form of relationship with the column actor, in their report. As will be shown below, there are many other aspects of relationships that can be shown, other than simply whether the relationship exists or not. Click on each image to get a full-screen version in a new window. A network matrix can be converted into a diagram, and vice versa. In the network diagram above we can see aspects of the network structure which are not readily visible in the matrix description of the same network. There is a cluster of NGOs on the left, where all the NGOs are linked to each other. In the top left corner there are some isolated NGOs, not linked in to the network, and there are some NGOs that are quite central, having many connections (e.g. WILDAF and ABANTU). There are two types of networks that can be shown in matrices: one mode and two mode networks. In a one-mode network the list of actors down the left side (in the rows) are the same as those listed across the top (in the columns). The NGOs x NGOs matrix above is a one-mode network. In a two-mode network the row and column entities are of a different kind. For example, the rows may list NGOs and the columns may list different government policies that the NGOs are engaging with (See this Ghana example, pages 11-14). Type of relationship: Described by using numbers, such as 1, 2, 3,… to represent different categories of relationships, that have already been identified as of interest. Frequency of interaction: Described by using numbers to indicate frequency per period or in total. Or by indicating the relative proportion of an actor’s time spent on each relationship. The same information can be represented in network diagrams by using the colour, size and line type to code the type of links that exist between specific actors (as described in the matrix). Similarly the colour size and shape of nodes in networks can be used to code actor’s attributes. The choice of what kinds of actors, and what kinds of relationships between them, should be captured in a network description is a matter of choice. This choice should be informed by one’s theory or views, of what is most important about the network being described. By individuals seeking employment (CV/ Resumes). Applicants may be linked by previous projects, employers, and referees. Records of participation: People and organisations may be linked via their participation in various project “outputs”: workshops, training events, mailing lists, websites, etc. This kind of data is often held in databases. Content analyses of the text of reports can identify how often different relationships with others are mentioned. Household surveys can include questions about “who do you go to when you need (x form of help)? Surveys of workshop participants can ask about relationships amongst participants at the beginning and end of a workshop. Online surveys can be used to seek, and make available, data on different groups, including email list members and others not associated with such groups. The nature of the relationship between two actors. Such as between a donor and grantee. This is often the focus of reviews of aid agencies’ partnerships. The composition of the portfolio of relationships one actor may have with others. For example a given donor may have a portfolio of relationships with various grantees, all of which are addressing HIV/AIDS issues, but in different ways. The donor’s medium term strategy may be to change the composition of this portfolio, to work with more of one type, and less with of another. Hierarchical Card Sorting is a useful tool for making these strategies more explicit and open to review. The structure of relationships between a set of actors. Such as between the grantees of a donor, or amongst the donors themselves, or amongst actors in larger and more complex networks. This sort of evaluation is uncommon but very relevant to improving the systemic effectiveness of aid agencies. The next section looks in detail at the kinds of structural features of networks that can be examined. One or more pathways through a network. For example, how clients should and do move through complex networks of service providers in the social and and health services sector in the UK. In aid programs the focus of attention is more likely to be on the flow of funding and information and influence, which might link the donor activities with changes in government policies and then changes in the lives of poor communities. A planning tool, called the Social Framework, has been developed to help document and monitor expected changes in a pathway of relationships through a wider network. This is an adaptation of the Logical Framework, which has been widely used to develop logic models of development projects. 9. Structural features of networks. The structure of networks needs both description and interpretation. This because while it is true that there are various structural features that can be found in many networks, the meaning of these features is typically highly context specific, depending on who is being asked, and where they fit within or outside the network we are talking about. Seeking stakeholders interpretations of the significance of network structures will be easier, if we can talk in more specific terms about network structures The structure of networks can be described in a variety of ways. Some of these are straightforward and easy to understand. Others involve some complex mathematics, and won’t be discussed here. Interpretation will be discussed in further below. How central or peripheral they are E.g. Closeness = the average distance between an actor and all other actors in the network. How similar one actor’s position is to others. E.g. Cliques = a group of actors totally connected to each other. All possible connections exist. Don’t forget the actors themselves. An exclusive focus on structure of relationships within networks runs the risk of ignoring an equally important dimension of networks: the members and their attributes. Stakeholders in a network may be just as concerned with the overall membership of the network as with any structural features of the relationships between them. Similarly, with the contents of their relationships. It is no simply the existence of relationships but the kinds of relationships that will matter to stakeholders. These two basic elements that make up the structure of networks can easily be lost sight of. Because quantitative social network data is increasingly amenable to the use of social network analysis software there is a risk that analysis of networks will be reduced to a 21st century version of “number crunching”. If the data is there, and the software is there, why not crunch the numbers? The answer is that this will only take us so far. Analysis needs to be informed by a theory of what is supposed to be happening. While our own theories may be interesting and relevant, the theories of the actual participants in these networks will probably be even more so. This is especially the case in development projects, where there will usually be some intention to seek change in the behaviour of at least some of the actors in the network. Social network analysis has come from an academic background, so there is still plenty of room for innovation relating to practical applications. Especially in participatory approaches to the description, analysis and planning of networks. Individually, by being survey respondents and providing data on their place in networks of interest. This is the most limited form of participation, but the most widely used. In situations where members of a network of interest are in conflict, or do not see any common interest, it may be impossible and / or unwise to bring them together in a workshop setting. In some cases data can be collected via one to one interviews, but fed back collectively, when participants are interested to see the wider picture that will be provided. In workshops network diagrams can be developed live, by projecting network analysis programs like Visualyser onto large screens and inviting participants to identify which actors are linked to which, and in what ways. Discussions can be about both actual and desired structures. 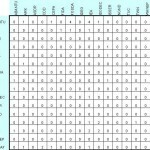 Alternately, blank actor x actor matrices can be projected onto screens using Excel, and participants can be asked to list the relevant actors, then fill in cells values describing the kind of relationships between these actors that are of interest. Summary rows and columns can be used to automatically aggregate data about each actors links to and from others. In outdoor situations Venn diagrams can be drawn on the ground, in a small group setting, to capture relationships between groups of people. Venn diagrams are only useful to describe small networks. Eva Schiffer has developed a physical toolkit for network mapping and discussion in small groups. This method can be used to describe larger networks than those covered by Venn diagrams. Dynamically, by involving people in what are called “social simulations” of networks, whereby they take the part of a given actor (person, organisation or group) in a network, and make a relationship with another in that network, to pursue an objective. This process is then repeated over a number of iterations, or generations, allowing people’s subsequent choices to be informed by their knowledge of the choices made by other actors in the previous iteration. Differentiate Mapping from Navigating. External specialists / facilitators can help map the territory (i.e. the networks of interest). But the actors in that network need to do the navigating, deciding where they need to go: what sort of relationships to develop, change or end. Facilitators can help by pointing to structural features of the network (as in see section 9 above) and asking if and how they need to change. They can also help by feeding back the aggregate consequences of these decisions by individual members. Spreadsheets with summary rows and columns are one simple way of providing this aggregate feedback. Or, if network diagrams are projected on the screen any changed links can be drawn on the screen as they are proposed. Predict, test, discuss: Asking people to predict the aggregate results of an earlier survey or workshop exercise, before they are shown the results, is a very effective way of engaging people in discussion and analysis of these results. Using a matrix participants can be asked to predict relative values in the summary rows or summary columns. Using a network diagram with actors names removed they can be asked who they think occupies various positions shown in that diagram. Then they can be shown the actual results in the matrix or network diagram. The bigger the gap between participants’ predictions and the actual observed results the more likely it will be that this process will be adding value, by improving participants’ (and facilitators’) understanding of what is going on. Discussions about the gap are likely to focus on two important issues: (a) The method used (was it at fault, was it better than previous methods?) and (b) on the reality being observed (why does it look like this, when we thought it was like that?). Network structures change over time, and so do the attributes of the actors and relationships within those networks. It can be useful to try to map or model these changes. One simple means is to treat separate network diagrams as slides in a rapidly moving slideshow, describing changes in the structure of a given network over time. Some software like Visualyzer allows series of network diagrams to be replayed like this. Even the “View as a Slideshow” option in Windows can be used for this purpose, if network diagrams are saved as image files. The NodeXL template for Excel provides another means, this time for describing changes in the attributes of actors and relationships within a given network structure. If actors are each given a numerical value (on some attribute of interest), and the same is done with each of the relationships between them, formula can be inserted in a NodeXL worksheet that will generate new values for the actors in the next time period, depending of how each actor is connected to the others in the prior period. This process can be reiterated through any number of time periods, creating a series of new values. Because of the complexity of some networks, the final values that are produced through this iterated process may not be easily predictable at the first glance of a network structure. A very simple imagined example in Excel is available here. (NB: NodeXL needs to be installed and used within with MS Excel 2007). PS: Click on Show Graph in left panel, to make the network structure visible. In Systems Thinking and Capacity Development in the International Arena (in Beyond Logframe; Using Systems Concepts in Evaluation, 2010) Bob Williams has written on what he sees as three core systems concepts: Relationships, Perspectives and Boundaries. The first of these is the oldest idea, and one which Bob describes as being the “wiring diagram stage” of thinking systematically. In discussing this core concept he introduces two methods that highlight inter-relationships: “Systems dynamics” and “Viable systems modelling”. Somewhat to my surprise he makes no mention of social network analysis as a method. Yet, as far as I can see there is no other set of methods for describing inter-relationships that has been so extensively developed and so widely used. The second core concept is Perspectives. This emphasises the fact that the relative importance of particular inter-relationships depends on the different purposes you can ascribe to any single situation.This is an important point, which I try to make by saying to people that how you read a network depends on your “theory of change”, what you think should be happening. It is important to help people articulate their expectations when viewing networks, as part of a process of learning, both about differences in views with others looking at the same network, and about differences between what was planned and what actually happened. Perspectives are also important when using social network analysis visualisation software. Almost all versions of social network analysis software enable you to filter out specific kinds of actors and specific kinds of relationships, in order to focus in on what you think is most important. This is a very valuable feature of the software, you are not just given one static view. But it also requires that you think about the different perspectives you are looking for, and why so. Random searching amongst different perspectives (i.e. different combinations of actor and relationship attributes) will waste large amounts of time. Searching informed by a prior idea of what is important helps enormously. The third core concept is Boundaries. In some ways this is an extension of the perspectives concept. This is about being clear what has been left out of the network, by whose decision and why so. The choices made about network boundaries affects the whole range of perspectives that can be taken on what is included in a network. Very few networks have natural boundaries that are easily identifiable and agreed upon by different observers. yet, for practical purposes decisions need to be made about what is to be included and what is left out. At a minimum, those decisions need to be transparent, to all those viewing and using the networks then described. A more ambitious approach is to engage people in actively thinking about what is outside the network as described, and how they could be affecting what is happening inside the network. PS: 3rd November 2010. Please see Richard Hummelbrunner’s extensive comment on this section, below under Comments. Robert wrote one of the chapters in the “Beyond Logframe…” book cited above. 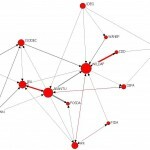 On another section of this website I have compiled a list of Social Network Analysis software packages, along with some comments on those packages I have been using. In 2004 I provided some supporting inputs into the evaluation of INASP-Health, as seen from a network perspective. A major activity organised by INASP-health was a series of 31 meetings on health information issues, over a period of years. One part of my analysis focused on the linkages between these meetings, and the participants who attended them. See pages 6-9 of this report for more information. Relationships between a series of workshops organised by the Making Markets Work for the Poor project in Vietnam. Potential links were created when participants from one workshop subsequently attended another. Were these emergent or planned outcomes? How important and satisfactory was the collective outcome? In analyzing a one-mode social network with valued directional ties, what in your opinion are the most fundamental characteristics of the network as-a-whole and it’s individal nodes should be reported so that broader comparative meta analysis is possible? IMHO, there are number of structural features that be identified in most one-mode networks. These are listed in section 9 above. But identifying those which “are the most fundamental characteristics” is a real challenge, because judgements here will always depend on the context, and the observer’s purpose. For example, are you trying to facilitate or disrupt a communication network, and is this network seen as a public good, like the internet, or a public threat e.g. a criminal network. Thanks for the recent addition on ‘Relationship of SNA to systems thinking’, which I find very helpful for outlining the systemic value of SNA. If Bob Williams has not mentioned SNA in the paper that you´ve quoted, it was probably an accidental omission. As you know, in our new book “Systems Concepts in Action” (Williams, Hummelbrunner; SUP, forthcoming Nov. 2010) we have featured SNA as one of nineteen systems methods and have also extensively reflected on its utility from a systems perspective. •	Concerning perspectives, reading a network not only depends on the “theory of change” of the various actors, but even more so on how they view particular inter-relationships. And in addition to help people articulate their expectations on networks, it is equally important that they bring forth their own experience and values. By adding these stories during a reflective process, a network diagram can be transformed into a ‘rich picture’ of inter-relationships. And seeing the bigger picture through the kind of visualizations made possible by SNA also may change the self-perception of actors and lead to a new understanding of relational patterns. •	The wealth of analytical possibilities that SNA software nowadays offers is indeed a challenge, but I see this more as an issue of boundaries than perspectives. Important boundary questions must be resolved when carrying out an SNA: Those related with the selection of actors and relationships should be guided by their relevance for the concrete issue and the possibility to gather data with proportionate efforts. As with any simplification, what is left out of a network map can be as important as what is included, and often only a look at the overall picture will reveal the relevance of those not (yet) included. And choices must be made to keep SNA simple and obtain useful visualizations or meaningful network measures. •	With respect to boundaries, I find looking at the various sub-groups or sub-networks often more revealing than the boundaries of the entire network. Furthermore, who is (not) included and connected is in many cases not a matter of deliberate choice or decision, but happens – and changes over time. Therefore it is equally important to analyse the emergence of network boundaries and the underlying factors, which are often connected with issues of self-organization that are inherent when networks are viewed as complex adaptive systems. In my opinion the relationship of SNA to the systems field should be explored even more in the future, since SNA lends itself well to capturing inter-relationships in complicated or complex situations. I find two approaches that you are working on particularly promising in this respect: The use of SNA as an alternative to prevailing linear (stage) models for representing theories of change, i.e. to move from Logical to Social Frameworks. And the use of two-mode networks, which allows to analyse how actors are related to other entities (e.g. concepts, objectives, projects). Thanks for spending free time in order to publish “Monitoring and Evaluation NEWS ? Network models and Social Frameworks”.